Mainstream apps and business processes are moving into the cloud, but right now, M2M (Machine to Machine) runs on proprietary platforms, which blocks any move into this cost-effective ICT environment. However, next-gen all-IP networks have similar functionality. Therefore we can expect to see standards-based net-centric platforms enabling the apps in the future. That would seem to be a bold prediction and when it happens - there’s no if - M2M apps and services will become an integral part of our life, both as consumers and business professionals. That process is already underway, however, proprietary platforms equate to stovepipe ICT solutions - good solutions that are working well - but ICT is driven by standards. Standards generate economies of scale, so prices go down: they create bigger markets so more and more applications are developed. And, when relevant, the information provided by these apps is easier to integrate into mainstream business processes. Applying the intrinsic functionality of all-IP networks such as provisioning an access control to M2M tasks will take time, but the constraints are more likely to come on the business side. Most Tier 1 mobile network operators (MNOs) are finding their feet in the M2M space. They are either partnering with or acquiring MVNOs, the companies that created the platforms, so there’s no rush to replace them. And in some cases they have spun off their M2M activity into a separate company in order to perform in a more nimble fashion. These new operations will need to gain experience and establish a track record before moving to a model based on the ICT cloud. WHO WILL SET THE STANDARD? When there’s a standardized platform application developers will be able to write to a common set of APIs and IT management will be more likely to integrate these applications with their business processes, e.g. CRM and ERP. ETSI (News - Alert) are active in this area and the idea for this article came from Telit’s house magazine. Go to pages 38 and 39. There is a technical committee whose overall objective is the creation of open standards for M2M communications. A key conclusion of the short ETSI article is the need to replace the current vertical approach with a horizontal one that has a common system architecture and shares system elements. There is a schematic on page 39 that has generic three-layer architecture: access, core, and applications. This reminded me of flat, all-IP next-generation architectures, which can be simplified into the schematic shown in figure 1. Figure 1. A high-level, generic view of a next-generation network and its layered architecture. It is worth noting that this structure enables a business model that leverages network functionality in order to provide managed access to applications created by third parties, not network operators. This model is based on connectivity and service enablement, but it triggered the idea of employing the network functionality that goes with this model as a de facto M2M platform. A key feature of next-gen networks is the ability to share system components such as presence and deploy them in different applications, so it should work for M2M. Sharing system elements was, as mentioned earlier, a key objective of ETSI’s model. It’s clear that a next-gen network can provision and manage data SIMs: it’s an intrinsic function, but what else do M2M platforms do? I asked a leading MVNO and this was the answer: SIM Activation; SIM Tariff reconciliation; SIM cards activations by date; Deployed SIM cards; SIM card Status; SMS to see network availability; Text to machines via SMS; APN Configuration; SMS to machines for test and firmware updates; Hierarchy admin rights for Dealers and or end customers; Network activation traffic lights; and there’s more. My next question went to Oma Elloumi, who is ETSI M2M vice chair and editor of the Architecture Specification for M2M (and part of Alcatel-Lucent (News - Alert) Bell Labs). Could the network replicate this functionality? Maybe not all, but quite a bit. The reply was very interesting. At a higher level the functionality could be into these API categories: Data Push/Pull or Publish/Subscribe; Policies; Access Control; Addressing; Provisioning; Location; Billing/Charging; Diagnostics and Management. And this maps to the functionality of a next-gen network, so technically it would appear to be doable. 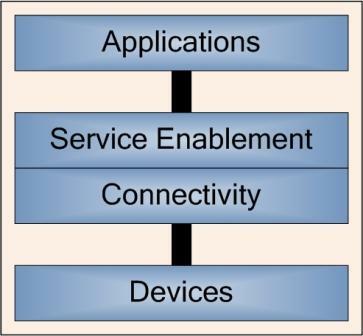 Service enablement (see figure 1) is a middleware layer that facilitates the creation of applications. You can think of it as an open operating system: the software developers write to this layer via open APIs. Open systems are mandatory in ICT environments. Therefore it’s safe to assume that M2M will go down that route in order to facilitate the convergence of M2M and regular computer data, i.e. mainstream business processes. Another likely IT requirement would be the ability to employ the same middleware platform for the management of notebooks and smartphones and M2M assets. The Telenor (News - Alert) Group is an innovative carrier that has been active in M2M on a local level since 1999 and in July 2009 Telenor Objects was formed. This operation was running an ambitious, forward-looking program based on a shift from proprietary, closed solutions to an open, layered architecture. So, it made sense to revisit the site and see what, if anything, has materialized. Figure 2. A high level overview of the main Shepherd interfaces and components. What I found was something called Shepherd. What’s in a name? In this case it’s a managed services offer for M2M solutions. As shown in figure 2, Shepherd creates a separation layer between devices and applications that shields complexities and allows for increased flexibility, at both ends. This enables the devices to be exchanged without making changes to the end-user application. Furthermore, Shepherd is offered as a Cloud service, which means that it includes access to IT infrastructure and support services. 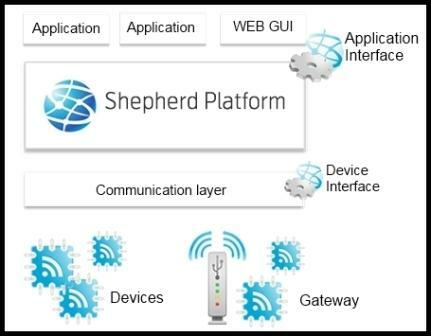 Devices are integrated to the Shepherd platform via communication interfaces and given unique ObjectIDs. They then become Shepherd objects and can be accessed by customer applications using open APIs, which are either device or service enablers. Data generated by the objects (the “payload”) is captured by Shepherd, stored, and made available through APIs. Management functionality monitors the infrastructure ensuring availability, persistence, and storage of object generated data. CONCLUSIONSM2M is expanding, both in the B2B and B2C sectors, and its success is mainly down to the MVNOs, i.e. the companies that created their own platform. They have the momentum, while many operators are basically in catch-up mode. MNOs will continue to benefit from M2M’s growth since they carry the traffic, but baseline connectivity is a commodity and MVNOs can shop around to get the most competitive deal for themselves and their customers. Acquiring platform assets allows operators to move up the value chain, but their position will obviously be enhanced when platforms run in the cloud. They will not only be able to take a larger slice of the M2M cake, but managing solutions within the preferred ICT environment of large enterprises will facilitate the integration of M2M information with back office systems. To find out more about M2M visit the M2M Evolution Conference. To be held Oct. 4 to 6 in Los Angeles and collocated with ITEXPO West 2010, the M2M Evolution Conference will focus on how telemetry has been changing to take advantage of the Internet, where WAN and LAN systems were points of aggregation in the past today’s machines benefit from the ability to connect worldwide. And as the machines continue to look to network the wireless world represents a large growth opportunity for data communication. Don’t wait. Register now.